As the new year begins, a number of international trade agreements are pending between the United States and major trading partners. Trade agreements can ensure that the United States may continue to gain access to world markets, which will result in an improved economy and additional employment of Americans. 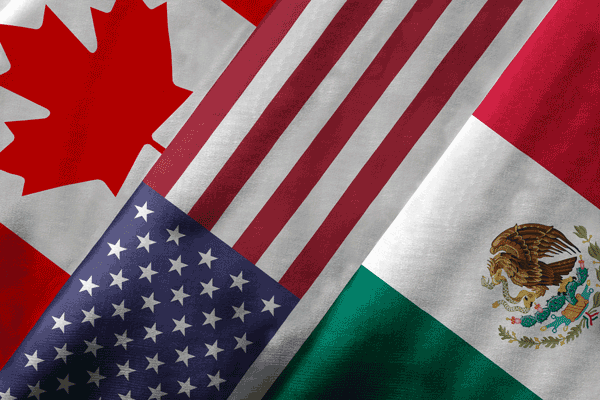 First is the 2018 negotiated U.S.-Mexico-Canada Free Trade Agreement, with the objectives to eliminate barriers to trade, promote conditions of fair competition, increase investment opportunities, provide adequate protection of intellectual property rights, establish effective procedures for implementing and applying the agreements and resolving disputes, and to further trilateral, regional and multilateral cooperation. The California Chamber of Commerce actively supported the creation of the North American Free Trade Agreement (NAFTA) among the United States, Canada and Mexico, comprising 489.5 million people with combined annual trade with the United States being around $1.139 trillion in 2017. In August 2018, the U.S. and Mexico reached a preliminary agreement, while the U.S. continued separate negotiations with Canada. In October, Canada and the U.S. came to an agreement, reassuring the deal would remain trilateral. The pact was rebranded the United States-Mexico-Canada Agreement (USMCA). CalChamber support for the USMCA is based on an assessment that it serves the employment, trading and environmental interests of California, the United States, Mexico and Canada, and is beneficial to the business community and society as a whole. The CalChamber is hopeful that Congress will approve the new USMCA agreement, following the objectives and procedures of the Trade Promotion Authority. In October 2018, President Donald J. Trump announced his intent to enter into trade negotiations with three new markets, one of which is the European Union. The trans-Atlantic economic partnership represents the largest, most integrated and longest-standing regional economic relationship in the world. The EU market represents more than 511 million people, and has a total gross domestic product (GDP) of $17.28 trillion, as of 2017 (World Bank). Presuming the United Kingdom exits the European Union in March 2019, the EU will consist of 27 countries: Austria, Belgium, Bulgaria, Croatia, Cyprus, Czech Republic, Denmark, Estonia, Finland, France, Germany, Greece, Hungary, Ireland, Italy, Latvia, Lithuania, Luxembourg, the Mediterranean Island of Malta, Netherlands, Poland, Portugal, Romania, Slovakia, Slovenia, Spain, and Sweden. California exports to the EU were $31.29 billion in 2017. California is the top exporting state to the EU, with computers, electronic products, chemical manufactures, and transportation equipment as the state’s leading export sectors to the region. EU countries purchase roughly 18% of all California exports. The CalChamber is hopeful that the U.S. and EU will further free trade agreement negotiations in 2019 to deepen the world’s largest trading and investment relationship, with a focus on trade and investment initiatives. The U.S. maintains a deep trade and investment relationship with the United Kingdom, the fifth largest economy in the world. Presuming the U.K. leaves the European Union in March 2019, the two countries will be able to enter into formal free trade agreement (FTA) negotiations. Two-way trade between the United States and the United Kingdom was $109.4 billion in 2017 and the U.K. was the fifth largest importer of U.S. goods with a total value of $56.3 billion. The United Kingdom is California’s 10th largest export destination, with more than $5 billion in exports. Top categories are computer and electronic products, transportation equipment, second-hand merchandise and chemicals. British investment is especially vast in California, where it supports approximately 105,000 jobs and the number of U.K. subsidiaries exceeds 1,000. (British Consulate General, San Francisco, 2012). The U.K. contributes 19% of foreign direct investment (FDI) into California, more than double that of any other country. The CalChamber supports the goal of strengthening the trading and investment relationship between the two countries, with a focus on securing open market access. In October 2018, the United States and Japan announced negotiations toward a potential U.S.-Japan FTA. Japan is the third largest economy in the world, the fourth largest importer of U.S. goods, and the fourth largest source of imports into the U.S. It also is the third largest investing country into the U.S.
California continues to be the top exporting state to Japan, accounting for 18.9% of total U.S. exports. Japan has remained California’s fourth largest export market since 2010, after Mexico, Canada and China. California exports to Japan totaled $12.85 billion in 2017; computers and electronic products accounted for 20.3%. Imports into California from Japan were $40.5 billion; transportation equipment accounts for more than half. California is the top importing state in the United States for products from Japan and buys more products from Japan than any other country besides China and Mexico. The U.S. and Japan will begin FTA negotiations in 2019 with the goal of expanding bilateral trade in a mutually beneficial way to achieve freer and more balanced trade, as well as encourage economic development. On October 16, 2018, the U.S. Trade Representative notified Congress that the Trump administration intended to start negotiations following the completion of necessary domestic procedures. This began a congressionally mandated 90-day consultation period under Trade Promotion Authority before the launch of negotiations.